Our Knowledge of Southern Nevada's security needs and our dedication to providing dependable and professional security services for our residential as well as commercial customers continue to be our mission. As new technologies become available, we stress-test them in order to provide you, our customer, with the highest confidence that Alarmco will always do everything possible to give you peace of mind for the security of your home or business. Besides ever improving technologies, our local monitoring services also utilize constantly improved capabilities to provide you with the confidence that you deserve. That has been our legacy since 1950 and it is our dedicated commitment to our community to continue to earn that confidence and trust. With all best wishes for our community's safety and success in every way. The company was started by Lew Whitney in 1950. It was called Merchant Patrol and Alarm. The corporate name Alarmco, Inc. was initiated in April of 1964. Mr. Whitney went to Los Angeles and learned the business by working for no pay at a Los Angeles alarm company. He installed in the daytime and ran service at night. He came back to Las Vegas and installed his first alarm in Thrifty Drug Store on Fremont Street. He worked from a small work shop at his home next to the old Sands Hotel. He eventually purchased Federal Alarm and moved into his future wife, Ethel's answering service, "Telephone Answering Bureau." At one time Mr. & Mrs. Whitney had eight business', alarms, guards, patrol, answering service, radio common carrier, secretarial service, print shop and a babysitting service. Early one morning they were both on a separate phones solving problems and they said, " this has to stop", so they sold everything except the alarms (good decision). 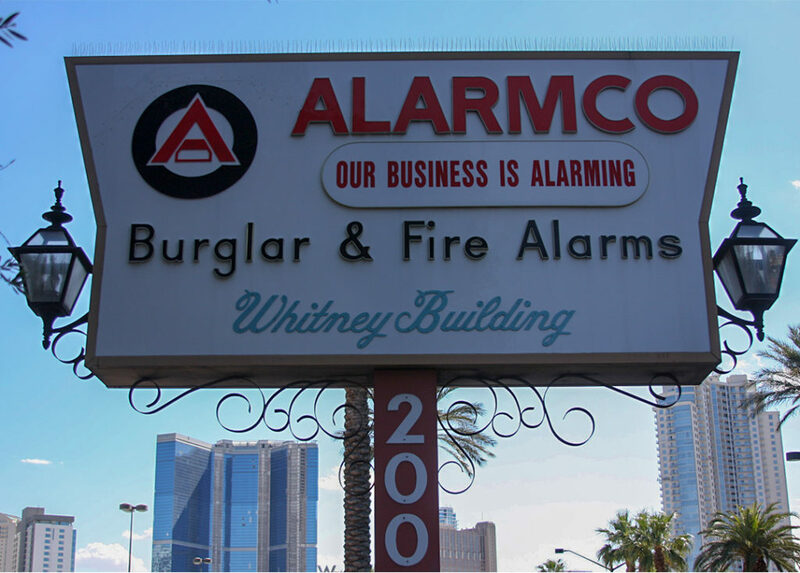 Alarmco, Inc. and the Answering Service were in a store front on Las Vegas Blvd South across from the telephone company. The property was sold, torn down and became a parking lot. They then moved to Heers-Roder Building at Las Vegas Blvd and Charleston, which has also been torn down. With the money from selling all the other business they bought and remodeled a small house on South Sixth Street. In 1980 they ran out of room and purchased the former Southwest Gas Company headquarters where Alarmco. Inc. is today. Alarmco, Inc. became Underwriter's Laboratory certified in 1968 and shortly after became Factory Mutual certified (fire).